Please join InterNations & the EU Chamber of Commerce for our very special annual joint-event! We are very pleased to be joining the EU Chamber for this event, especially in the spirit of Thanksgiving, which is much like the spirit of InterNations… to join cultures and meet new and interesting people! 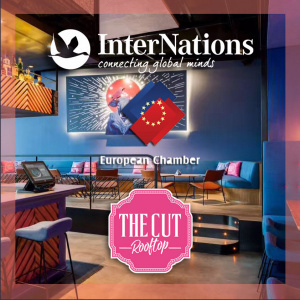 We will be enjoying the pleasure of The Cut’s newly renovated rooftop (indoor) on top of IAPM mall with spectacular views of downtown Shanghai. The Cut is owned and operated by the same group that runs Mr. & Mrs. Bund and Bar Rouge. Wines sponsored by LastCorkWines.com, giving consumers the lowest price for select quality wines on the market due to their unique supply strategy. The dress code is Smart Casual with a requirement of a blazer or sports coat for men. With a win-win relationship with wine importers, Last Cork can clear the last bottles and give the consumer the lowest price on the market.